Whether for equipment, food, or service – at 4-Star Bike Hotel Tauernblick in Bramberg cyclists get excited. Your bike security is very important to us for your mountain bike holiday in the Salzburg Region. Find out more at reception about useful maps and advice or visit the mountain bike meeting table to get individual advice. In the hotel’s bike room you will find a bike-box and washing device. You can store your bike safely in the bike room overnight. We repair small issues directly at the hotel in the service corner. Get the strength you need with the special biker board: Xenofit energy bars and a high carbohydrate diet providing plenty of power for your strenuous days of biking. There is a tour for every ability level with our local bike guides! 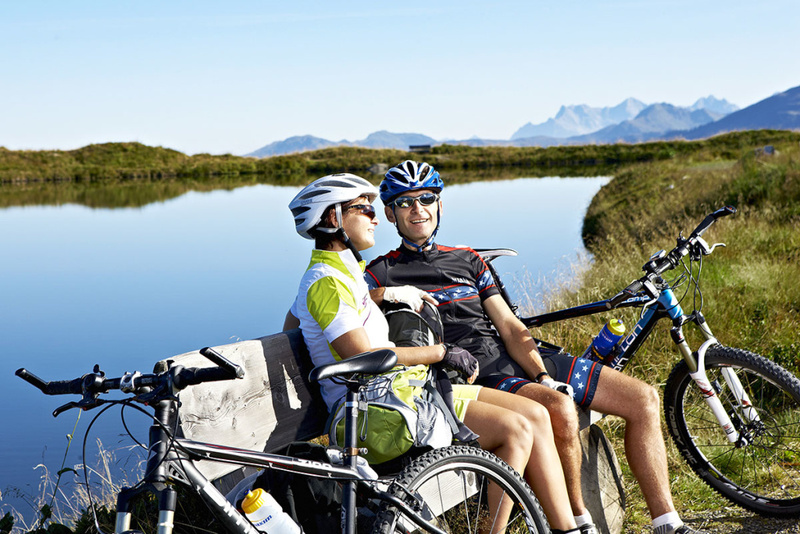 After a busy day of sport come relax at our Smaragd-Spa and refresh yourself with a healthy cocktail from the hotel bar – the perfect combination for your mountain bike holiday in Salzburger Land. Tours also available on departure days! All different types of bikes can be rented at Intersport Harms by the Wildkogelbahn base station. Kids - Mountain Bikes up to 24"
Additional information about bike rentals can be found in the current Intersport Harms folder.